Build familiarity with Cameron AND creating sales among existing and new local retailers. This will facilitate and encourage growth. 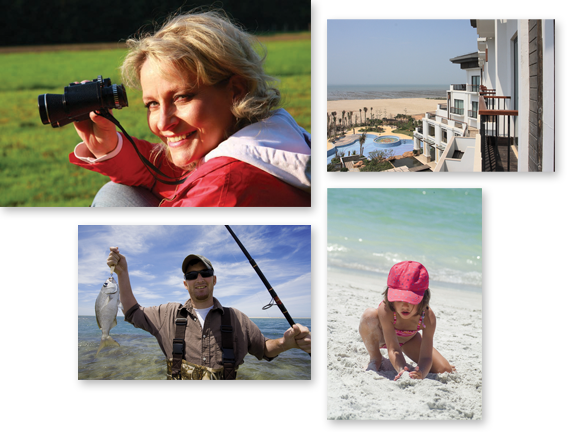 Consult with the existing entities in tourism, conservation and industry, like The National Audubon Society, The Nature Conservancy, the Louisiana Universities Marine Consortium, Creole Nature Trail, the Cameron and Southwest Louisiana Convention & Visitors Bureaus, and fishing and hunting guides, for advice on visitation patterns, and to build partnerships for the future. These organizations and Cameron have similar goals and each benefit by coordinating their efforts. Develop our wildlife attractions. Especially, what is unique and can be field-studied here only? We may establish a research center for this type of study, establishing the location as the worldwide authority. Because of the huge numbers of waterfowl and other migratory birds landing in Cameron each season, the area can be a greater draw for birding enthusiasts. Our state-run Rockefeller Wildlife Refuge together with the Cameron Prairie National Wildlife Refuge, Lacassine National Wildlife Refuge and Sabine National Wildlife Refuge provide a concentration of conservation areas unique in America. 1) it will immediately attract year-round visitation from Lake Charles, Beaumont and Lafayette, from those already accustomed to evening restaurant travel. With the storm-forced closure of the restaurant, Harbor Lights, in nearby Big Lake, all evening and weekend dining travel to Cameron has ceased. A new signature restaurant is most important to send the signal that Cameron is safe to return to and return from; 2) this project builds confidence with the oil companies who do business in Cameron. They need evidence of our stability as a base for their operations so they will not only stay, but increase their presence here when oil futures encourage them. At, or nearby to, the hotel/restaurant site, construct a new marina for pleasure boats, and provide temporary dockage for local shrimpers to sell directly from their boats to those wanting the freshest seafood to take home. Because of its location at the mouth of the Calcasieu Ship Channel, Cameron is also the jumping-off point for hundreds of deep sea fishermen and their pleasure boats. Cameron needs to service them with marine gas, ice, food supplies, and an evening gathering place. At the State level, and coordinating with all appropriate Welcome Centers and CVBs, secure funding and installation of wayfinding signage promoting the Birding Trails established for the region. Ironically, the trails are established, but with no signs to guide birders, the sport is, literally, hard to follow. Attendant to signage, there must be an effort at cooperation with landowners to grant permission for birders to enter private properties. Also, there is a need to organize and promote birding tours, sightings and events as part of a robust web site. Promote all facilities to all outdoor sportsmen, and help promote access to professional guides. Experienced duck hunters know Cameron Parish as a premier flyway destination for ducks and geese as they migrate south from the rest of North America. And, to be sure, there are high-end private hunting clubs like Grosse Savanne and The Marsh Club where professionals organize, guide and host the well-heeled hunters who travel the world to experience the best the sport has to offer. With a new hotel and increased promotional efforts, adventure tourism will increase, and with it, revenues to local businesses. Rehabilitate, enhance and promote our beaches. Rutherford Beach and Holly Beach were traditional recreation spots for many sunbathers over the decades. Though tidal patterns and currents have never provided the pretty sand or blue-green surf found in, say, Florida, thousands of families still made these beaches their own in summertime. Holly Beach, in particular, grew into a small community of vacation homes, trailer houses and camper pads for those wanting a beach weekend close to home. Hurricane Rita, however, destroyed all but the most substantially built (just as Hurricane Ivan did to Gulf Shores, Alabama, in 2004), so Holly Beach today is a sad collection of pilings and concrete slabs (although it must be said that several large homes have been and are being built). We believe that fresh sand and restroom facilities will draw fresh attention to the area as a modest vacation spot. This shouldn’t be difficult to achieve!